Simmental cattle are a versatile breed of cattle originating in the valley of the Simme river, in the Bernese Oberland of western Switzerland. The Simmental bulls have historically been used for dairy, beef and as draught animals. These bulls are particularly renowned for the rapid growth of their young, if given sufficient feed. Simmental bulls provide more combined weaning gain (growth) and milk yield than any other cattle breed. They also provide a good weight to meat ratio. The Simmental breed is also very resistant to extreme weathers. In Romania we can have temperatures as low as -20 degrees Celsius during harsh winters and up to 40 degrees in July-August. So they have no problems coping with high temperatures in countries like Egypt, Libya, Iraq and others. 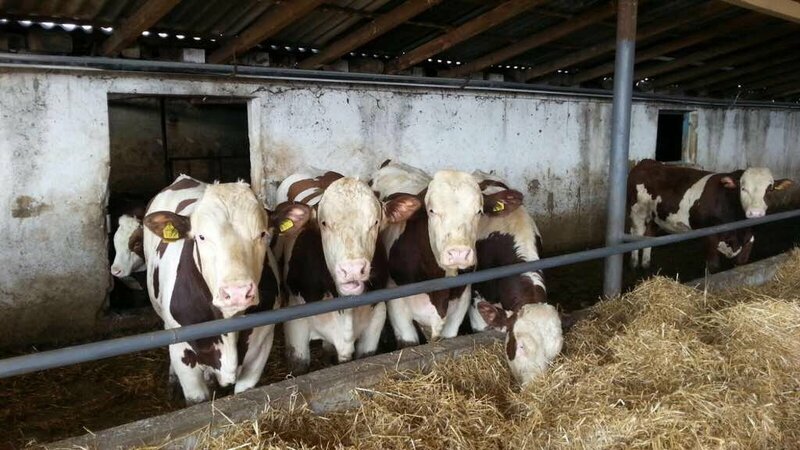 Simmental bulls are very popular in Romania and therefore can be exported in large numbers all year round. We prepare Simmental cattle starting from a weight of around 200 kilograms. At this weight category the bulls are strong enough to sustain a trip to anywhere in the Mediterranean area or even Arab Peninsula. The largest cattle that we work with are approximately 500 kilograms. We can export a ship of up to a maximum of 1,000 cattle.